THERE’S a great synergy to studying fire history in Canberra. The Centre for Environmental History has been the home for numerous historical projects. Canberra was home to one of Australia’s few forestry schools. The ANU’s Fenner School carries on a proud legacy of publishing bushfire research. The world-leading CSIRO has headquarters here. And of course the city, its people, and the surrounding bushland still bear the scars of the 2003 fires. 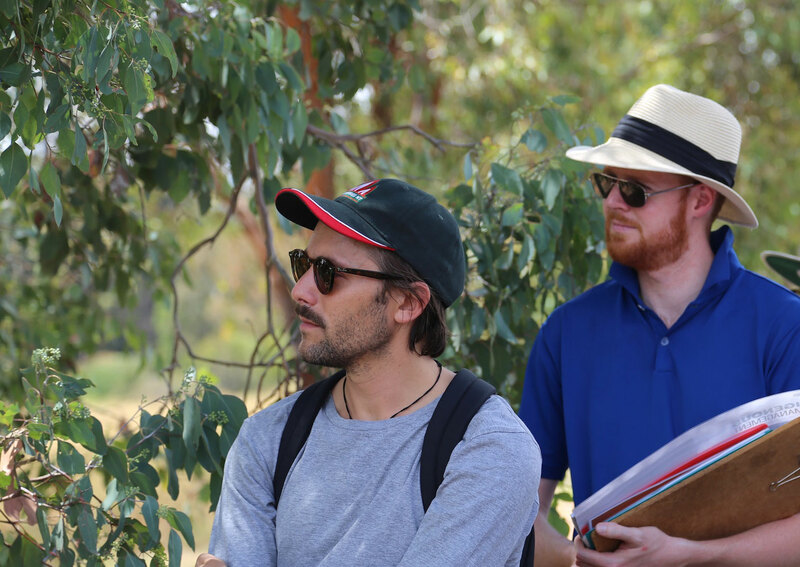 I recently had the opportunity to reflect on these connections while observing the ANU Fenner School course Fire in the Environment. Dr Tim Neale and the author listening to the Murumbung Rangers. The author is doing his best Brian Burke impersonation under the panama hat. Photo courtesy of Dr Jessica K Weir. This intensive course is coordinated by Associate Professor Geoff Cary, and includes a number of lectures, tutorial discussions, computer modelling sessions and field trips, all delivered within a (rather intense) fortnight. A student who sees the title Fire in the Environment might naturally assume a fortnight of ecology, biology and physics. Yet it was clear that the students were confronted and challenged by these assumptions. Geoff takes full advantage of the expertise available in Canberra; guest lecturers included specialists on the legal aspects of fire, arson, interactions between fire and fauna, genetics, remote sensing, and more. Indeed, the hurried rescheduling of a planned excursion due to a total fire ban was a good reminder that fire is not an abstract ecological process. Instead, it is an essential element to understanding the world we live in, especially in Australia. The effect of the 2003 fires on a stand of Eucalyptus delegatensis (alpine ash) is not something that can be fully conveyed by a textbook. 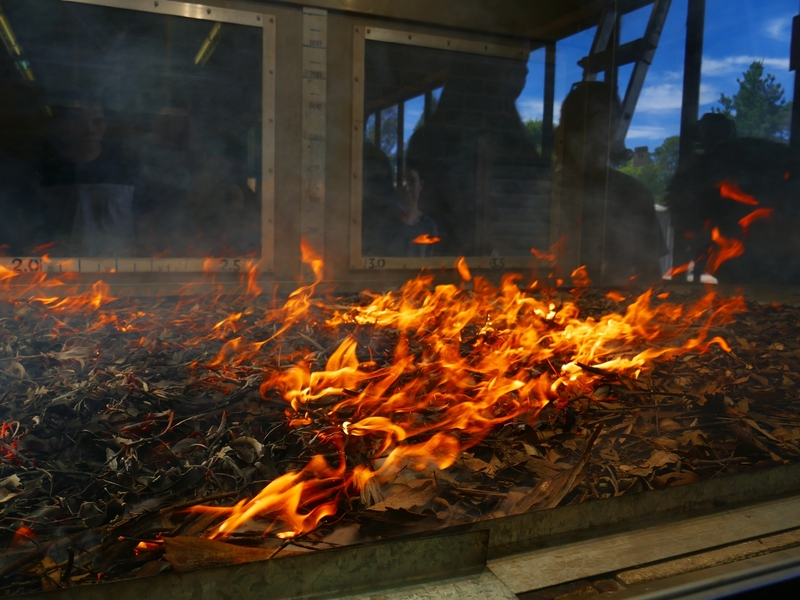 The course introduced students to cutting-edge research during a visit to the CSIRO fire laboratories at Yarralumla. 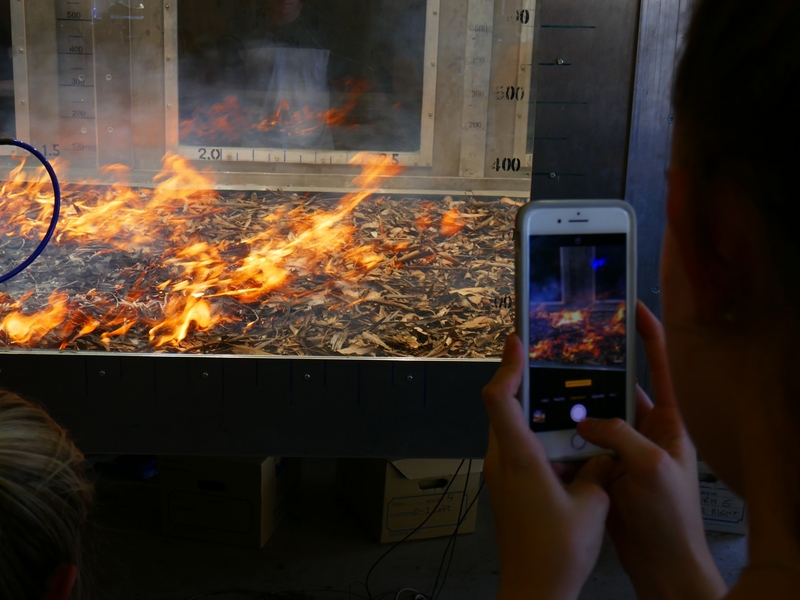 Here we observed the world’s only vertical wind tunnel used for bushfire research, the process behind computer modelling, and used the CSIRO’s ‘Pyrotron’ to conduct an experimental burn. This generated discussion around the famous McArthur model for bushfire behaviour and more recent models developed by CSIRO. The CSIRO’s Pyrotron in action. Photo courtesy of Associate Professor Geoffrey Cary. Other excursions took us outside the city. The effect of the 2003 fires on a stand of Eucalyptus delegatensis (alpine ash) is not something that can be fully conveyed by a textbook. A good environmental historian learns to read the landscape and its history; in this case information such as the presence of dead trunks and height of regenerating saplings revealed the history of a stand severely impacted by the 2003 fires, and even the prior stand’s origin as rebirth most likely from the 1939 bushfire season. History, as always, was literally all around us. In a similar fashion, a short trip to the suburb of Duffy (hit hard by the 2003 fires) highlighted the human dimensions of fire in the environment. The seemingly incongruous mix of new housing developments nestled among older homes that survived the fires is testament to the loss and heartbreak in this suburb. The highlight of the course for me was a trip with the ACT Parks and Conservation Service Murumbung Rangers, a network of Aboriginal men and women working to implement an innovative program of ‘cultural burns’ in the ACT. First we were taken to Mount Ainslie lookout. Locals know Mount Ainslie for the plaques depicting Marion Mahony and Walter Burley Griffin’s original visions for Canberra, but instead we were told of Aboriginal songlines and given an appreciation of country as seen through Ngunnawal eyes. 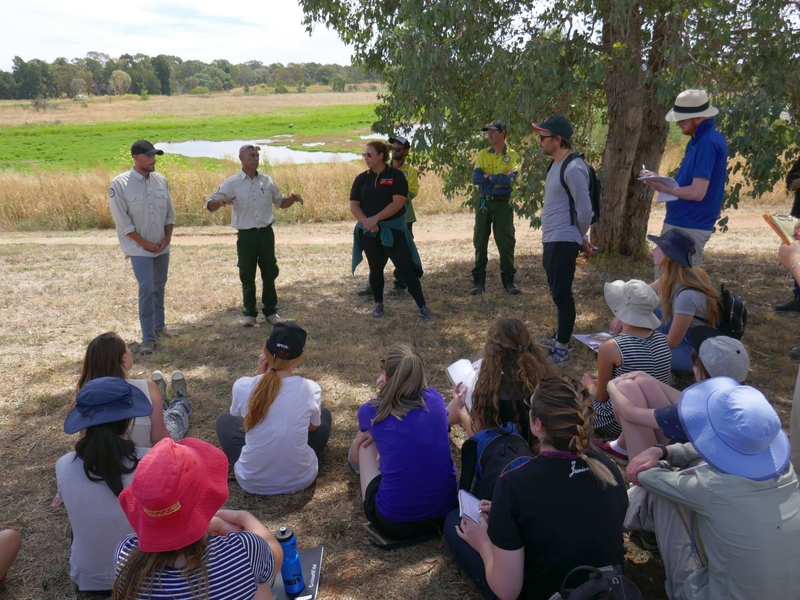 We then followed the rangers to Jerrabomberra wetlands, and discussed the issues of implementing cultural burns in a post-colonial landscape invaded by feral species. 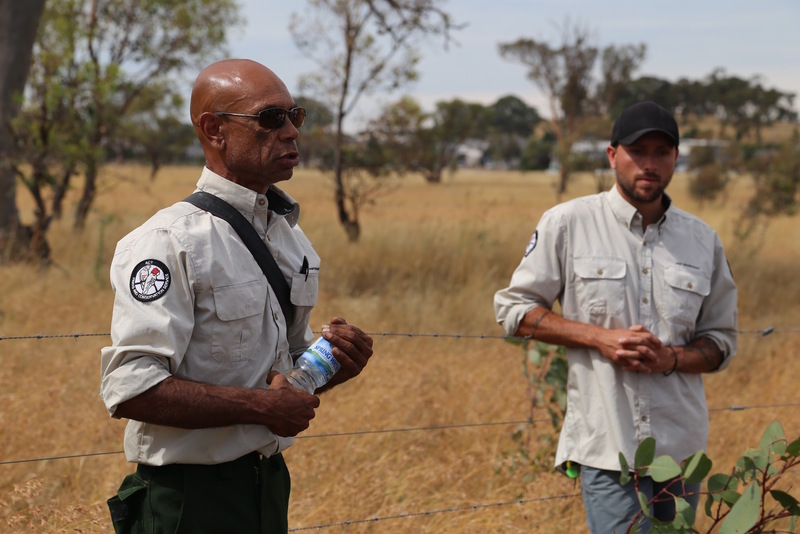 This trip finished at Mulanggari Grassland Nature Reserve; here the Rangers spoke of the success and challenges they’ve faced since this program began in 2009. In its own way, this trip reflected the suitability of Canberra as a place to study bushfire history, as cultural burning is nearly always couched in historical terms. ACT Parks and Conservation Service Murumbung Rangers Jackson Taylor-Grant, Dean Freeman, Krystal Hurst & Kie Barratt at Jerrabomberra Wetlands. Photo courtesy of Associate Professor Geoffrey Cary. The course finished with cake and comedy, courtesy of both the students and Geoff. The course left students more knowledgeable and more inquisitive, perhaps even a little overwhelmed. It left me with a greater grounding in the science of fire, a frenzy of inspiration from the engrossing discussions, and a renewed appreciation for Canberra as a place of and for – bushfire history. Measuring the height of Eucalyptus delegatensis. Photo courtesy of Associate Professor Geoffrey Cary.